Greening Alton and Holybourne arose as part of the Greening Campaign in Hampshire (originally). Phase 1 included extensive research to see what ‘Green projects’ were important to the community. Phase 2 was the development of several strands that were deemed by the local community to be important. One strand was local food and this was the start of Alton Local Food Initiative (ALFI). Another strand was energy conservation and ALEC (Alton Local Energy Campaign) started at the same time, this has evolved into Energy Alton. ALFI has regular annual events and monthly working parties, but over the years we’ve also had stalls at many other community events. The timeline shows the development of the plots and planters around the town and some of the main activities/events since our inception. ALFI was formed in 2009 to encourage and enable the local community to be involved in planning, growing, buying and eating local, responsibly-produced food. It was launched with a public meeting the following year. Seedy Saturday (seed swap) – This has been an annual event early in the year (January or February) since ALFI was formed. It now takes place in the Methodist Church Hall. Seeds are swapped or taken away for a donation. Seedling swap – This has also been an annual event as part of the Craft Market in May. Seedlings are brought to our stall for swapping or taken away for a donation. 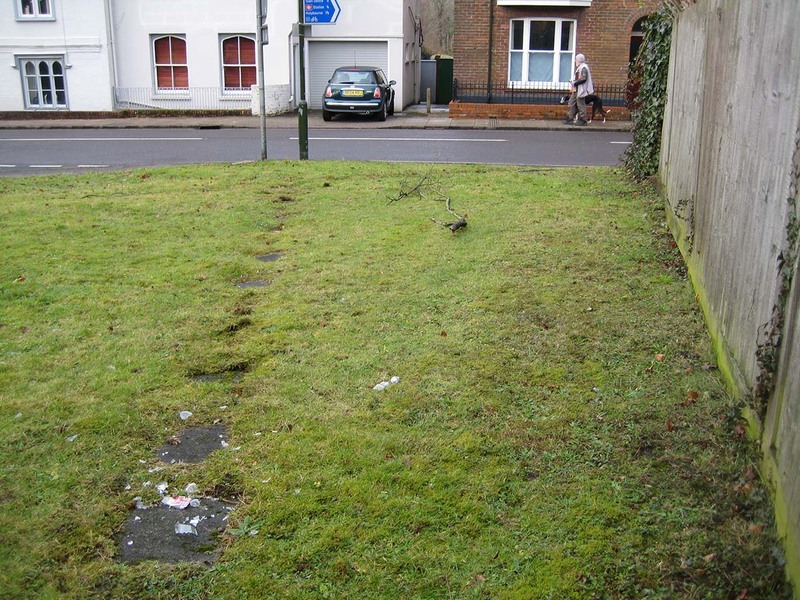 At the beginning of 2010 we asked Alton Town Council if we could use some plots and planters around the town to grow vegetables and herbs. 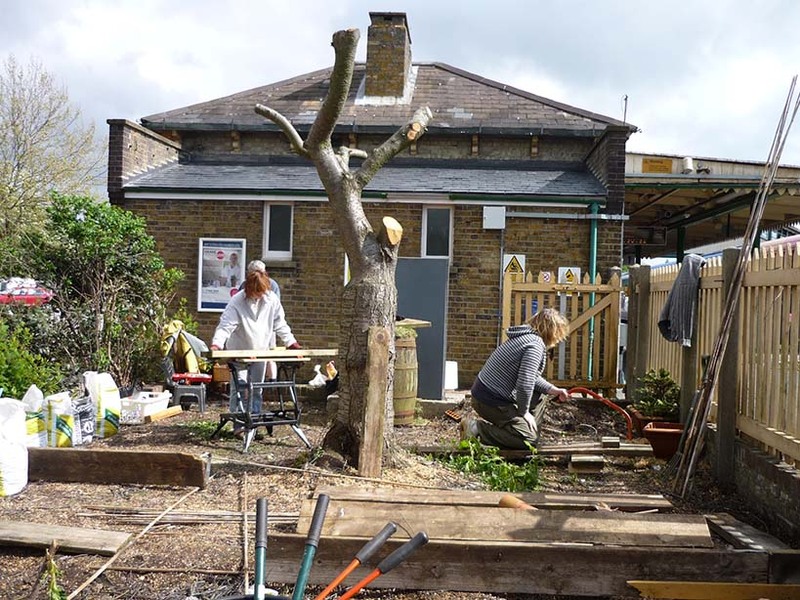 In 2010 we also asked SW Trains if we could use the disused plot beside the station and behind the taxi rank as a display garden for local food. Both were pleased to agree. Station Plot – started in 2010 – This was a disused plot . It now has four raised beds, hanging baskets, containers , soft fruit and herbs and a wall-trained pear tree. 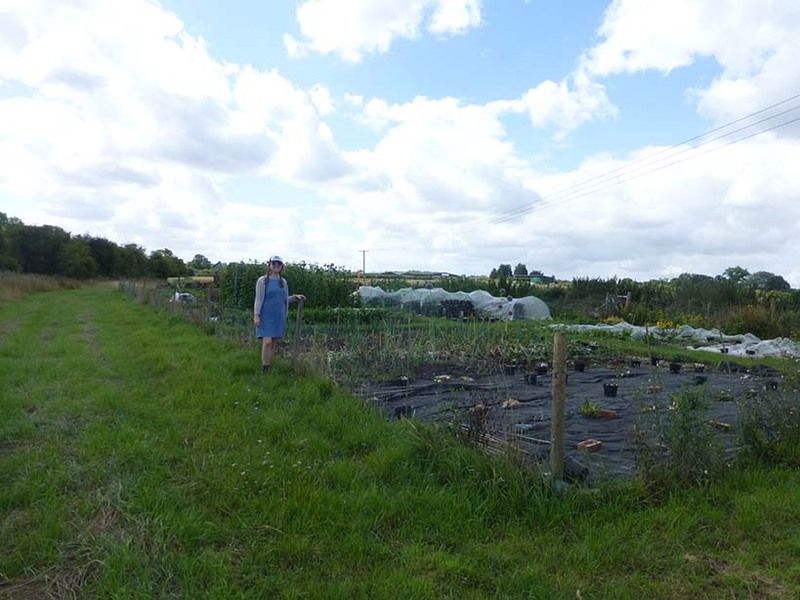 Westbooke Plot – started in 2010 – This was a roadside verge. 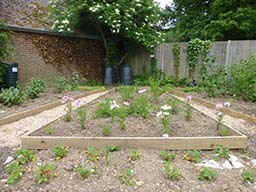 It is now a plot including two raised beds and several containers. The Hop Garden (opposite the Railway Arms) – started in 2010 – This comprised a few containers including hops trained to grown along the wall. It is now made up of several barrels containing hops and herbs. Since 2014 it includes the round concrete planters on that site that have been repainted in ALFI colours (greens and yellow). 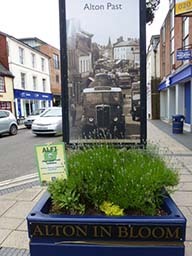 Town Planters (outside Boots and Costa Coffee) – started in 2010– all the ivy and other non herb plants have gradually been replaced by herbs. Schools liaison- started in 2010/11 – we gave primary schools seed packets and some grew seedlings to plant in some of our plots and planters. We also had a stall at the Alton College Green Week to encourage interest in eating local food. We’ve had a regular schools programme ever since that an annual schools competition with prizes. A ‘Community Farm’ project was initiated in 2010. This project brought together the aims of ALFI into a scheme to grow fruit and vegetables on an acre of land. In late 2010 a local land-owner kindly agreed to lease us the land at a pepper-corn rate. 2011 was our pilot year and much progress was made. A group of growers involved in the project have subsequently taken the project forward independently of ALFI , calling it Stonyfield. Community Orchard – In March 2012 fruit trees were planted at Jubilee Sports Field for a Community Orchard. 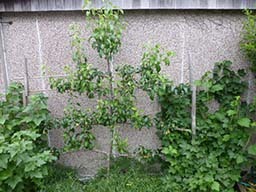 These were added to in 2014; the site now has 15 fruit trees including apples, pears, plum, cherry and quince. Out and About Planter at the Southview Rise Shops was started in 2013. 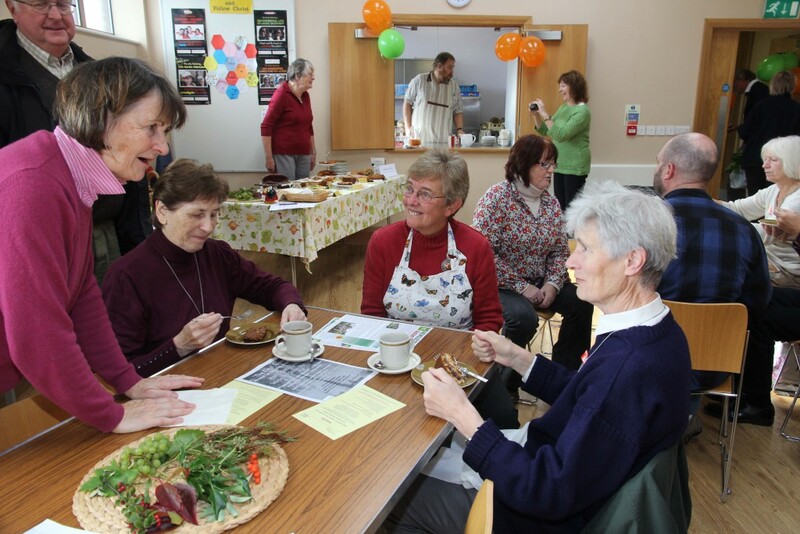 Harvest Feast – Since 2013 we have had an annual Harvest Feast for the local community. An event comprising coffee with homemade cake in the morning and homemade soup and bread at lunchtime. 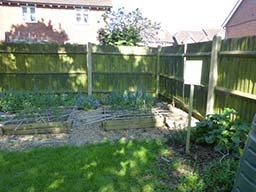 Brendoncare Plot – was added in early 2014, in one corner of the garden is a vegetable plot with small raised beds and a compost area, which is now managed by ALFI. in the garden, Some of the produce is given to the kitchen. 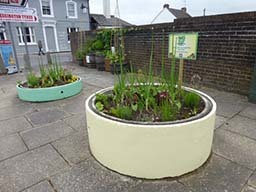 Allen Gallery raised beds – A raised bed in the Allen Gallery Garden planted up with more unusual herbs in 2014. 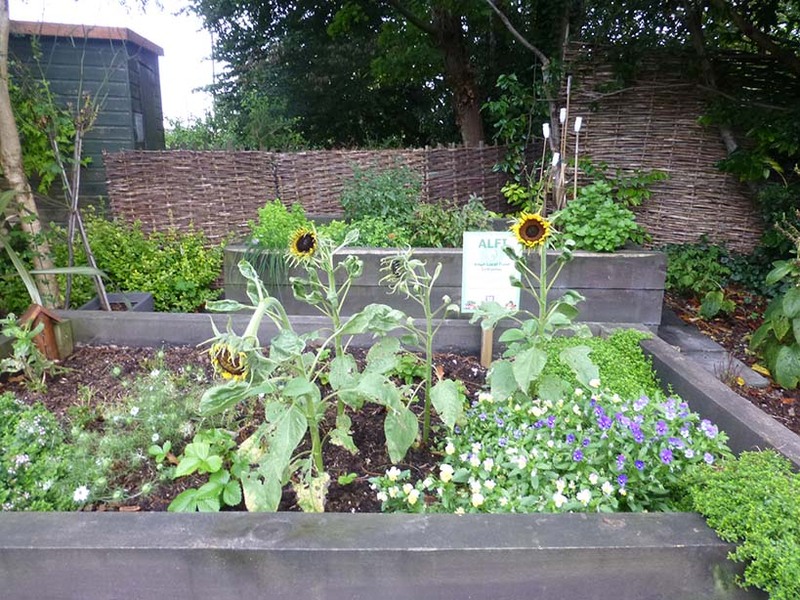 In 2015 a second raised bed was also taken on for gardening by ALFI and will also be used mostly for herbs. The Vicarage Plot – In June 2014 the Vicarage Plot at St Lawrence vicarage was cleared and in the autumn it was planted with soft fruit. 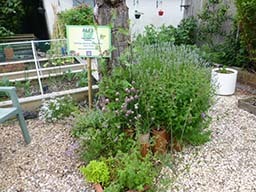 In 2015 water butts and compost bins have been added and further planting of lavender around the path has been carried out. 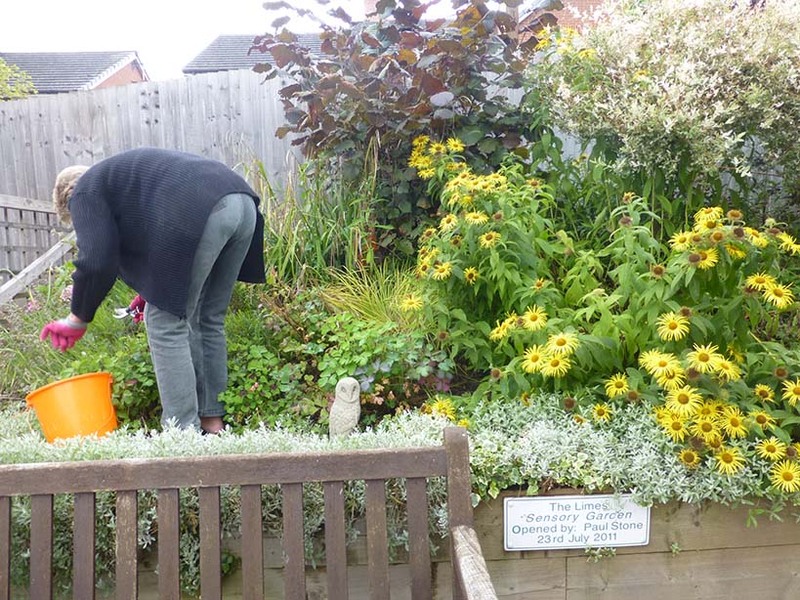 The Limes – In 2015 ALFI took over managing a sensory garden at The Limes. It will have bright colours and sweet smelling plants, including herbs. 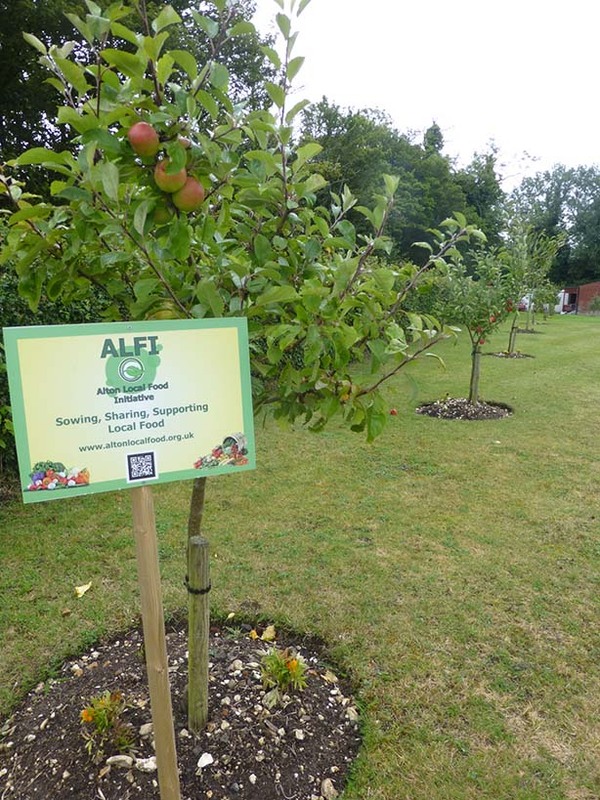 Signage – In 2015 professionally-produced signs were erected in all the plots with the ALFI logo, web address and the branding ‘Sowing, Sharing, Supporting Local Food’. There is also a QR code to take users to the website.